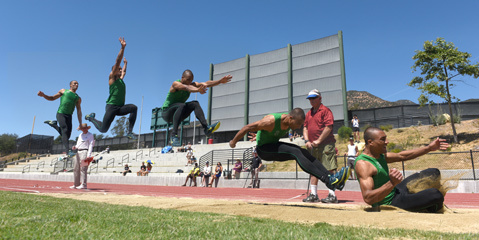 <b>JUMP, SPRINT, THROW:</b> Track stars love training in Santa Barbara, including decathlete Ashton Eaton (seen above in a long jump series) and UCSB standout heptathlete Barbara Nwaba (below). Both head off to Austria to compete in the Hypo Meeting. Götzis is a quiet alpine village in Austria that makes international news every May as the host of a premier multi-event track-and-field competition called the Hypo Meeting. Just as the most promising racehorses are sent to Louisville for the Kentucky Derby, the highly trained humans known as decathletes and heptathletes converge on Götzis. This year’s meeting is Saturday-Sunday, May 30-31. Santa Barbara is where Ashton Eaton trained this spring for his first appearance in the Austrian meet. A victory in the decathlon this weekend would be the culmination, rather than the beginning, of his own triple crown — the Oregon native won gold medals at the 2012 Olympic Games in London and the 2013 World Championships in Moscow — and it would also jump-start him toward this summer’s World Championships in Beijing and the 2016 Olympics in Rio de Janeiro. 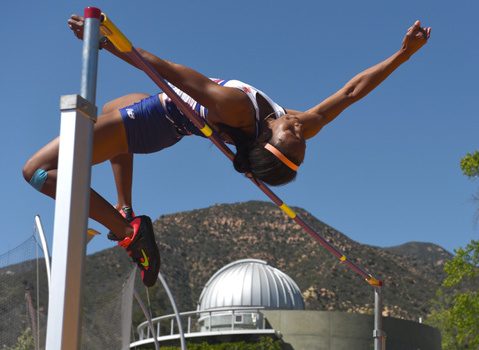 Two other athletes who toiled throughout March and April at the Westmont College track are entered in the Götzis heptathlon: Canada’s Brianne Theisen-Eaton, who was runner-up in the 2013 worlds and subsequently topped that by being wed to Eaton, and former UCSB standout Barbara Nwaba, runner-up in last year’s U.S.A. Championships. Although she also won the heptathlon at the Thorpe Cup, a team competition between American and German multi-eventers, this weekend will put Nwaba on a prominent world stage. She hopes it’s a big step toward Rio. S.B. Track Club coach Josh Priester will accompany Nwaba, the only U.S. heptathlete competing at Götzis. Her score ranks her in the middle of the elite field of 32 women. Britain’s Jessica Ennis-Hill, the defending Olympic champion, will do her first seven-eventer since she scored 6,955 points in her London victory. Theisen-Eaton, who won the Götzis meet in 2013 and scored 6,530 in Moscow, will be in the hunt. The Austrian villagers will be excited to see Eaton, who carries on the tradition of great American decathletes (Bob Mathias, Rafer Johnson, Bill Toomey, Dan O’Brien, and, yes, Bruce Jenner) and might take a shot at his world record of 9,039 points, set at the 2012 U.S. Olympic Trials in Eugene, Oregon. He can hang with the world’s best in a number of individual events — the 100, long jump, 400, 110 hurdles, and pole vault — but the challenge is to string together 10 superior performances in two days. KEEPING TRACK: Westmont’s Elysia Mitchell finished her college career as a 12-time NAIA All-American. At last week’s nationals, she finished second in the women’s 400 and also anchored the 4×400 relay to second place, passing four runners on the homestretch. … S.B. City College’s Bas van Leersum won the state community college title in the 400 hurdles, breaking his own school record with 52.20 clocking. … San Marcos High sophomore Erica Schroeder won her second straight CIF Division 3 title in the 800 (2:11.79) and will attempt to qualify for the State Meet on Friday. AV Bennett, a Bishop Diego junior, sprinted to the top of the podium in the Division 4 boys 100 and 200. … Another multi-event meet in Oyonnax, France, will include two S.B. Track Club athletes: Thomas FitzSimons Jr. and Lindsay Schwartz. BUMPY ROAD TO OMAHA: The NCAA made UCSB the No. 1 seed in one of the 16 four-team regionals that will start off the 69th Division 1 baseball championships this weekend. The regional will be played at The Diamond, the state-of-the-art ballpark of the Lake Elsinore Storm, a San Diego Padres affiliate. It is purported to be a pitcher’s park, which should bode well for the Gauchos. USC and Virginia will get things underway at 3 p.m. on Friday, May 29, followed by UCSB taking on San Diego State at 7 p.m. The double-elimination tournament will continue with two games on Saturday and Sunday and a final game on Monday if necessary. The regional winners will advance to eight best-of-three Super Regionals to be played June 5-8. Top-ranked UCLA is favored to host the winner of the UCSB regional. Super Regional winners will advance to the College World Series in Omaha, Nebraska, starting June 13.